I was given the book ‘How to ride a Giraffe – By John Timpson’ by the people from the rather excellent Real Business magazine and so thought it would be well worth a read, but I have to say that some of the first chapters really bored me – the history was fascinating but it was all a bit self congratuatory. But then it got to Chapter seven ‘Only great people need apply’. 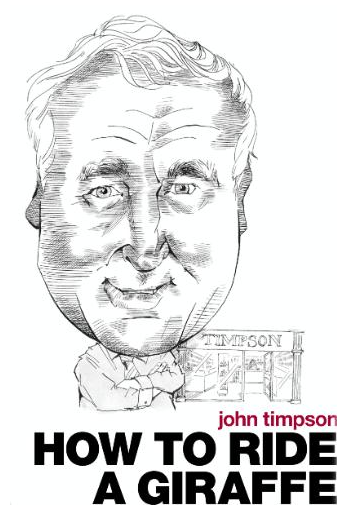 In this chapter, rather than looking back at what a clever bloke he is, John Timpson opens up about the recruitment of Timpson’s staff. His conclusion is that if they had only tried to recruit cobblers, they would have had a choice of 30,000 people or so, but by aiming to recruit people with the right attitude, they had a far wider choice and they could easily teach them to mend shoes, given a year or so of training. This is something that is very easy to overlook – particularly when times are tough. We are in danger of reverting to type and taking on people who are a safe pair of hands and can be dropped in to do a safe job for the business. But this can only ever put you in a holding pattern. Safe people will only ever maintain or slightly decline your business. Stars make it grow. If you look at how US basketball teams recruit, they look for giant kids. This is their version of buying the hardware. They know that again, they can teach some (or maybe even many) of them to play basketball – ie, adding the software. You can’t teach a kid to be a giant, just as you can’t teach an experienced cobbler to be a happy person with a customer service attitude, so buy the hardware and add the software with good training and mentoring. I’m reserving judgement as to whether the whole book is worth reading, but so far, this chapter alone makes it well worth the effort.